May 27, 2017 at Jardin des Tuileries. Three girls with a camera and a tripod. There was bound to be lots of photo op moments. This was one of many. We were walking around the Jardin des Tuileries when Rea suddenly exclaimed, “This is it!”. “This is what?” Glaire and I asked. 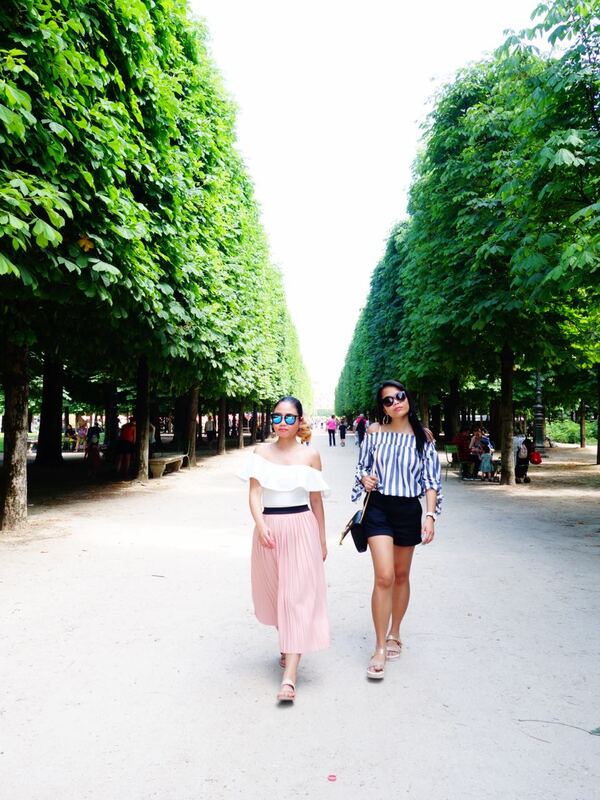 “I think this is where Heart Evangelista took one of her Paris photos!!!”. Heart is a famous female celebrity back home in the Philippines. Rea wanted to recreate a picture of her in Paris that had more or less the same background — a long pathway with tress lined up on both sides. “Abtik! Abtik!” — Rea’s favorite expression when she wanted us to hurry up, prompting us to start doing some poses. Glaire and I settled for walking towards the camera while Rea clicked away. We look quite serious here, but it was actually pretty difficult to keep a straight face while doing this. Few seconds after this particular shot, we were all doubled over laughing out loud. Some people near us and some who were walking by gave us funny looks, probably thinking we were very weird. We did not care one bit. Haha!